A gorgeous day…with high winds. Not a fascinating post, but it’s all part of daily life in this rig. 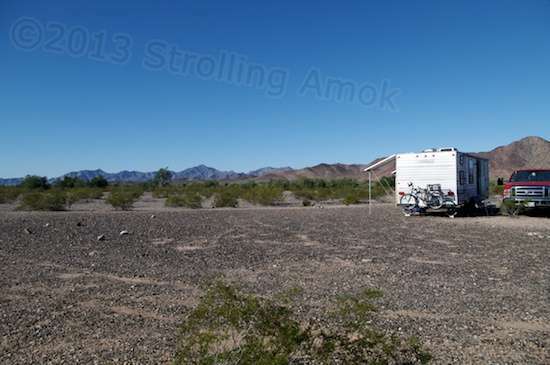 The heat wave of 90+ degrees in Quartzsite is over, and it’s expected to be a long spate of low-80’s for quite a while, which is the top of my Ultimate Comfort Zone. The new temperature front moving in is expected to produce southwest wind gusts in the 45 MPH range though. That means take all precautions, so I staked down the telescoping poles supporting the solar panels, and added the tie-down ropes, two to a panel. None of it should be needed in a wind hitting the trailer at the southwest corner (the trailer, as always, is aimed straight west) because it tends to merely drive the panels downward instead of lifting them. Since I don’t plan to move a thing for many months though, I figured now is better than later. The highest winds should arrive in a couple of hours and continue through until suppertime. That isn’t preventing the Enterprise from rocking a bit right now, however. A larger concern has been the relatively ineffective rubber wheel chocks. They seemingly were designed for smaller-diameter tires, because they don’t allow these tires any chance to step on their leading edges to keep them from creeping back. That allows them to slide on the ground too easily for my liking. This is normally a “who cares?” situation, but the tongue jack pad and solar system setup makes any trailer movement pretty risky. Out with the old. These chocks were bad on gravel and pavement, and are useless on the plank. Too easy to move with repeated little bumps. With a tin box this large, air drag in high winds is no subtle mystery. The only thing keeping it from rolling on the ground or rotating at the front end is the 1,000-pound tongue weight of the jack on its pad of two pieces of 4×4 lumber. (The jack is the original, and can no longer extend far enough for a lifted trailer.) That, and the wheel chocks. I noticed early on that the chocks tend to creep a bit, so all this time I’ve been driving large nails into the ground behind them to stop this. Now, to help the trailer’s tires last a little longer, I’ve got them resting on top of a 2×8 plank. Thus the chocks are nearly useless on top of those boards. Also of concern are the 4x4s at the front end. 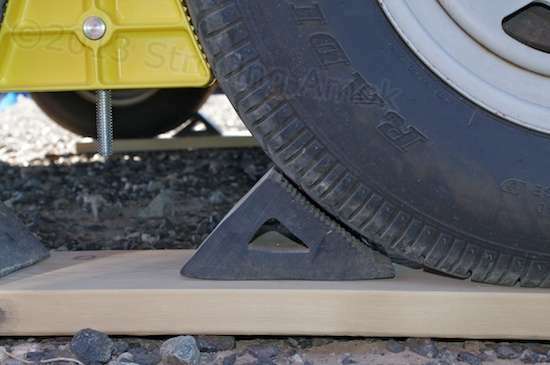 Without the tires resisting movement, those jackstand boards can get pretty tippy, making it possible for the jack shoe to flop off and hit the ground. That wouldn’t be good. In itself, the front end of the trailer suddenly going 8″ or so lower isn’t a huge problem: shut off the fridge and ride out the storm until it can be jacked back up on the boards again to make it level. The effect on the secured solar panels would be pretty bad, however. Why? It’s the way I have the tie down ropes and support poles configured: the easy way. If the trailer drops a lot, the poles lift the panel’s frame at bottom center, while the ropes try to keep that from happening by holding down the panel frame sides. The bending forces would try to bend and break the two forward-most solar panels, at the least. The easiest way to prevent this entirely is to simply keep the trailer from shifting. Given the bad wheel chocks and the somewhat tippy front stand, I went out and found a tire-locking clamp at a local Wal-Mart (thanks, Sis!) that wedges itself tightly between each pair of tires. Now, they can’t rotate a bit. Orient the tongue jack boards from side to side and, presto! The trailer can now neither rotate in a sidewind, nor roll forward or back, at least to the friction limit of the tires on each wood plank, or the plank to the ground. Given about 6,000 pounds on all four tires and 1,000 at the tongue, that ain’t gonna happen, short of the Apocalypse. 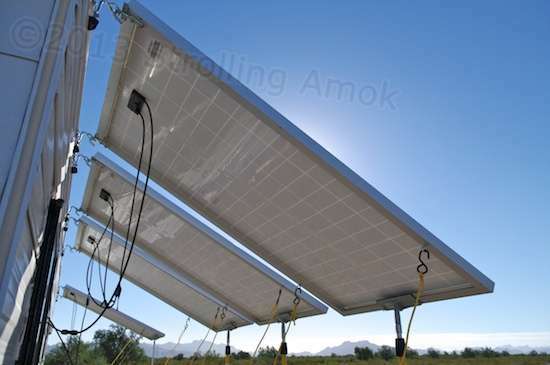 It’ll blow over before it skids, at that point making the solar panels a minor consideration. Crank this puppy tight, and nothing is going anywhere! The Quartzsite LTVA may not be exciting, but it’s cheap and is a great way to stay comfortable for many months at a stretch. Plus, there’s a coyote serenade nearly every night where I am. If I pull an Uncle Fester and join in, will they take offense and stop? Have you given any thought to covering the rubber tires for the months they are just sitting there? Sunlight is hard on them. I bought a set of covers at the Camping World Tent sale last year but other places sell them too. Oh ya! “Sunlight is hard on them” is an understatement. The Ford’s tires are 6 years old, and started chunking at the tread last year, in my first RVing season. At this point I’ve never found any covers that were affordable in quantity. 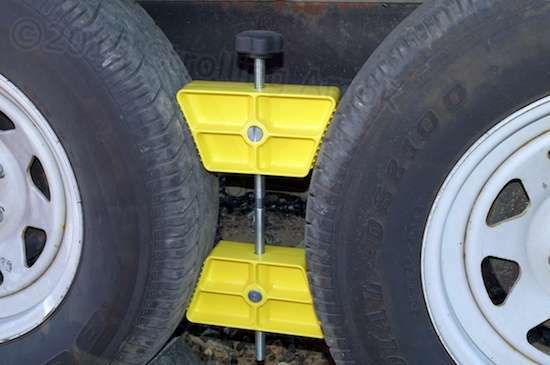 I do use one on the trailer spare, which is hanging out in the open. The “sun-side” tires I’ve covered with a $3 blue tarp, and I’m parking the Mighty Furd close to the shaded side of the trailer to limit exposure to early morning and late afternoon. I’m also making a half-hearted attempt to apply a UV-protectant spray on them, the Truxedo bed cover, and the Tankmin water tank topside – though that fortunately already has UV additives in its resin. Not much you can do for the truck if you’re going to be driving it all the time. Yup, I get it. The tarp should work, as it’s double-layered. Everything else spends at least most of the day in shade.